By the morning of Chinese New Year, 15 February, the Japanese had broken through the last line of defence and the Allies were running out of food and ammunition. The anti-aircraft guns had also run out of ammunition and were unable to repel any further Japanese air attacks which threatened to cause heavy casualties in the city centre. Looting and desertion by Allied troops further added to the chaos in the city centre. At 9:30 a.m, Percival held a conference at Fort Canning with his senior commanders. Percival posed two alternatives. Either launch an immediate counter-attack to regain the reservoirs and the military food depots in the Bukit Timah region and drive the enemy's artillery off its commanding heights outside the town, or capitulate. All present agreed that no counter-attack was possible. Percival opted for surrender. A deputation was selected to go to the Japanese Headquarters. It consisted of a senior Staff Officer, the Colonial Secretary and an interpreter. They set off in a motor car bearing a Union Jack and a white flag of truce towards the enemy lines to discuss a cessation of hostilities. 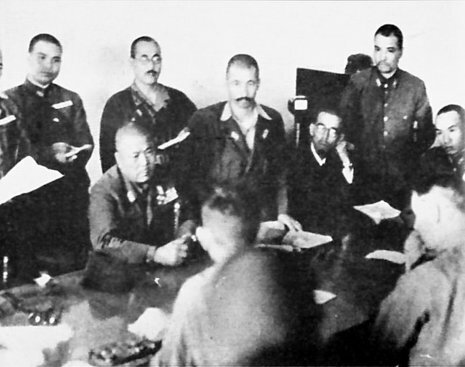 They returned with orders that Percival himself proceed with Staff Officers to the Ford Motor Factory, where General Yamashita would lay down the terms of surrender. A further requirement was that the Japanese Rising Sun Flag be hoisted over the tallest building in Singapore, the Cathay Building, as soon as possible to maximise the psychological impact of the official surrender. Percival formally surrendered shortly after 5.15pm. 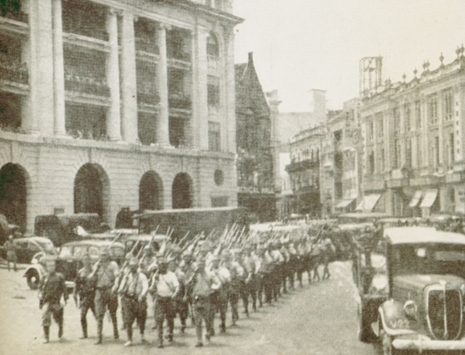 To prevent looting, etc., during the temporary withdrawal of all armed forces in Singapore, a force of 1000 British armed men to take over until relieved by the Japanese. Earlier that day Percival had issued orders to destroy before 4 p.m. all secret and technical equipment, ciphers, codes, secret documents and heavy guns. Yamashita accepted his assurance that no ships or planes remained in Singapore. 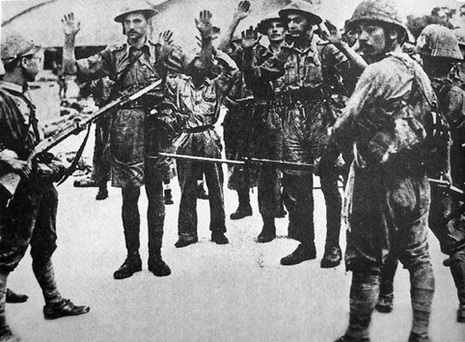 According to Tokyo's Domei News Agency Yamashita also accepted full responsibility for the lives of British and Australian troops, as well as British civilians remaining in Singapore. Bennett, along with some of his staff officers, caused controversy when he handed command of the 8th Division to a brigadier and commandeered a small boat. They eventually made their way back to Australia. As many as 2,000 civilians were killed daily as the Japanese continued to bomb the city by day and shell it at night. Governor Thomas cabled London that "there are now one million people within radius of three miles. Many dead lying in the streets and burial impossible. We are faced with total deprivation of water, which must result in pestilence...." On February 13, Percival cabled Wavell for permission to surrender, hoping to avoid the destruction and carnage that would result from a house-to-house defense of the city. Churchill relented and on February 14 gave permission to surrender. On the evening of February 15, at the Japanese headquarters at the Ford factory in Bukit Timah, Yamashita accepted Percival's unconditional surrender.